Last week, Chinese officials supported the position of Russia on both the Crimea and the Ukrainian conflict. Soon afterwards, it was reported that Russia sold S-400 air defense systems to the Celestial Empire. The contract was evaluated at $3 billion. Is there a connection between these events? China can wait, but it can not wait now. "We are opposed to any nation gaining independence through a referendum. As for the Crimea, there are peculiarities to it. We know the history of the affiliation of the Crimea well," acting director of the Department for European and Central Asian Affairs of China's Foreign Affairs Ministry, Gui Congyou said, as quoted by the South China newspaper. Deputy Head of the Department of CPC Central Committee on International Relations, Zhou Li said: "Russia and China face various challenges. But I can say with certainty that soon we will face even greater challenges. We have to fight together, protecting the interests of our countries. The main thing is not to let the Americans drive a wedge between our countries," said the official. On Thursday, it was reported that Russia was selling S-400 Triumf systems to China. Beijing intends to buy at least six divisions of the renowned missile systems worth more than three billion dollars, the Vedomosti newspaper said with reference to its sources. Noteworthy, Rosoboronexport officials refused to comment on the news, whereas a representative of the Federal Service for Military-Technical Cooperation refuted the information. Should Russia develop this scheme of cooperation with China? To do this, one needs to know China's immediate needs and be able to bargain. The principle is as follows: China gives Russia strong political support (what Russia needs a lot), and Russia gives China its arms. Some Russian experts critically pointed out the fact that the above-mentioned statements were released from "minor Chinese officials." However, China's top diplomats, unlike their European counterparts, do not demonstrate vivid emotions and outspokenness. "This is considered disadvantageous and even dangerous, because statements from top officials are extremely difficult to disavow without losing face afterwards. In China, in order to voice sharp transitions from one diplomatic platform to another, there are positions of "Acting Head of Department for Europe and Central Asia Affairs" and the like. Both of those second-line officials turned out to be in the company of Russians - diplomats and journalists - just in time and used the chance to their advantage. The world has every reason to think over the problem," the South China newspaper said. Russia should try and make China's top officials speak out as well. In light of aggressive policy of the United States in the Asia-Pacific region, which is expressed in discussions of war with China, up to a nuclear conflict, China desperately needs modern air defense systems, and it is Russia that can give them to the country. Chinese military expert Li Jie said in an interview with People's Daily that "S-400 can quickly improve our air and missile defense and ensure rapid absorption of related technologies." "S-400 is a vertical launch system, they are capable of striking any target in any direction, including aircraft and missiles. More importantly, the S-400 is particularly suitable for interception operations with strong electronic interference in the background. These are very important advantages in future wars," said Li Jie. The expert believes that "on the issue of Ukraine, Western countries show all-sided pressure on political, economic, military and other Russian systems, especially after the fall of oil prices. Given the acute shortage of investment, Russia remains in an urgent need of help from China." The expert expects a "sincere first step" from Russia, and the sale of S-400 systems to China could be such a step, he believes. Li Jie noted that China had no achievements in military technology, for example, in the engine-building industry, but cooperation with Russia may help fill this gap. "China is trying to pull everything it cal from Russia, - Mikhail Karpov, a sinologist, Associate Professor at the Higher School of Economics told Pravda.Ru. - China is the main beneficiary of the evolving geopolitical situation in the world. The country will be achieving its goals with Russia's help. China may like our territories. Russia already provides an opportunity to the Chinese people to migrate. The Chinese take direct participation in the capital of Russian businesses too. The peculiarity of Chinese policy is known throughout the world. They will go deep into Russia against the background of the geopolitical situation. From their position, they are right, they are acting in their own interests." From the point of view of the expert, Russia's large gas contract with China was a "head feint before the United States," to show the Americans that "we are with China." "In fact, the commercial component of the agreement is not clear. To a large extent, this is a political component. It still remains unknown what the contract will eventually lead to, given big problems with the development of the gas fields under the contract," said Mikhail Karpov. Andrei Devyatov, Deputy Director of the Institute of Sino-Russian strategic cooperation, secretary of the Union of Russian military sinologists, does not believe the Chinese either. "From the time of Sun Tzu, the Chinese policy is an endless path of tricks," he told Pravda.Ru. As for the S-400, the expert believes that the Chinese took advantage of the moment, when Russia found itself in the dollar trap. "It was Russia that had to sell the systems to China," he said. However, three billion dollars will come to Russia as a compensation for the non-delivery of French Mistrals. This is not the amount that could solve the problem of Russia's dollar liquidity. After all, China needs to understand that after Hong Kong, it will have Macau that has already announced its readiness to hold a referendum on further principles of relations with mainland China. The situation in Hong Kong was stabilized quickly, but the referendum in Macau became a previously unthinkable challenge for Beijing. It appears that China will continue to deal with Washington's pressure in the Pacific Rim in the future as it is very easy to provoke a military conflict for the possession of islands there. China needs to make its own first sincere step towards Russia - give the country political support on the top level. As for the "penetration" into Russia, these fears are exaggerated. In the western and northern parts of China - those that border on Russia - are home to only six percent of the Chinese population. The Chinese do not like the Russian climate, it is too cold for them here. Russia needs to learn to work with China. In the spring of 2014, the Kommersant reported that Russian President Vladimir Putin authorized the delivery of S-400 systems to China. 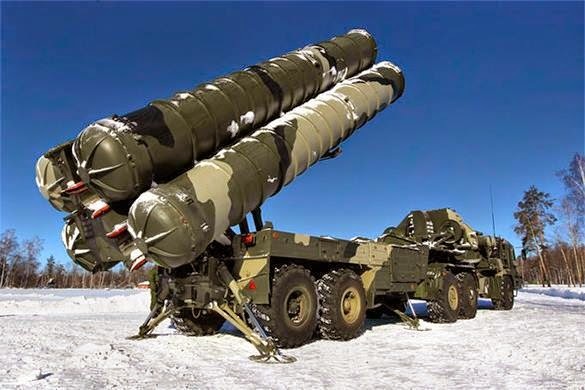 This summer, the head of the presidential administration, Sergei Ivanov, said that the first foreign recipient of the S-400 system will be China; he named a preliminary delivery date - 2016. The first missile regiment of S-400 was deployed in the Moscow region in 2007. The second one - in the Kaliningrad region. In 2010, China bought 15 multi-channel anti-aircraft missile systems S-300 from Russia. Each of those systems can simultaneously direct up to 12 missiles. Yet, those missiles have no control over the sky over Taiwan. The S-400 can do it.